I'll also draw a winner to receive a $30 gift certificate. The winner will be announced on my blog by Saturday, February 4th at 8:00AM EST. I was so excited to see an ink splash set. It is such a versatile set and I made the focal point of my layout. I also cut out images from photos, something I have never done before but I like the way it looks. The "Let the Wind Carry you" is such a whimsical set. I created a lot of floating bubbles using the set on this dotted patterned paper from the Reflection kit. Not my usual style but it is so light, airy and dreamy. For this layout I used the Artist markers to colour the flowers. They are amazing and the colours are so vibrant. There you have it. Lots to see and so many new products. I always have a hard time choosing. What are your favourites? Emily Leiphart. I love her work ... so delicate and sweet. And here is the full list. Have fun hopping. Your layouts are so pretty! I love how you use a white background with a pop of bright colors, the effect is stunning! The black and white background really brings out your work of art. You combined two of my favorite things bubbles and splotches beautifully! Great layouts!Thank you for sharing! I love how you've used the new products on your layout designs!! These are done brilliantly! I especially love the blue and green colors on your long stemmed flowers! Great layout! Thanks for sharing! Wow!! I love that colorful flowers. The blue and green together are so beautiful and whimsical. Just downright lovely!! Thanks for the inspiration. 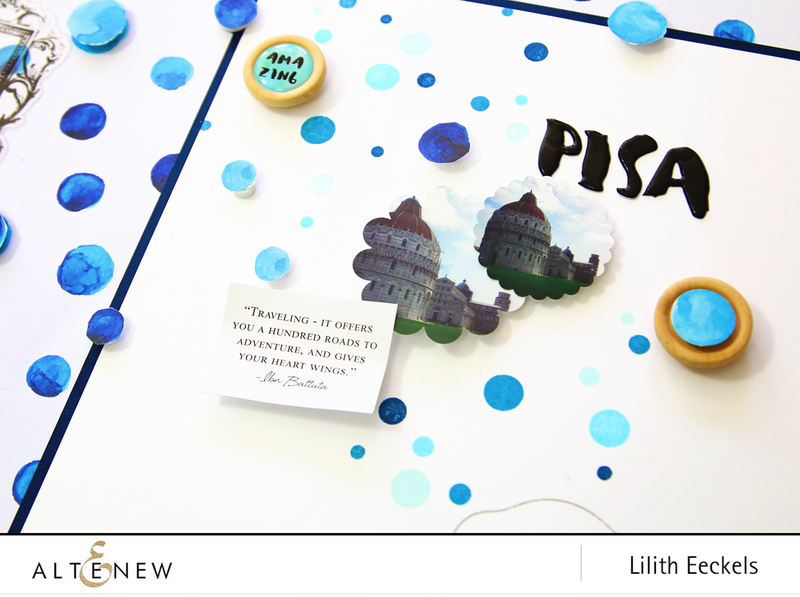 Amazing projects Lilith. The backgrounds of your pages are fantastic. Such pretty colors. Those blue flowers and bird are beautiful! Love, love, love. I make just loving the use of stamps on layouts. Totally fabulous. The ink splashes are a favorite. When I taught I used a book called the Big Orange Splot. It was a great story for my elem. students. My first love was scrapbooking but haven't done it in years, you inspire me to pick it up again! Interesting layouts, ty for sharing. OH Wow! Your layouts are stunning!! Loving the backgrounds on the first two, and the flowers on your third are just beautiful! FAB creations! Great colors and designs! Loving that Dream, Wish, Believe! I'm not a scrapper (is that the right term?) but I enjoyed your layouts, especially the first. Probably because I'm a wee bit partial to little boys, having a l 1/-year-old grandson! Your layouts are awesome! Love the cutout pictures on the first one & the coloring on the floral one is stunning. I need those markers!! I love how you coloured the flowers on the last layout! The colours really pop against the black and white photo. I love all your bright colors! Thanks for the chance to win. Your art is really lovely!! Your designs are so lovely. I wish I had started scrap booking when my daughter was little. She is all grown now and I have tubs of "stuff" that should have been organized. Pisa! You bring back happy memories of my visit there. even thought it has been a lot of years. Another perspective, I didn't even realize what the ink splotches were until I saw your layout, perfect! 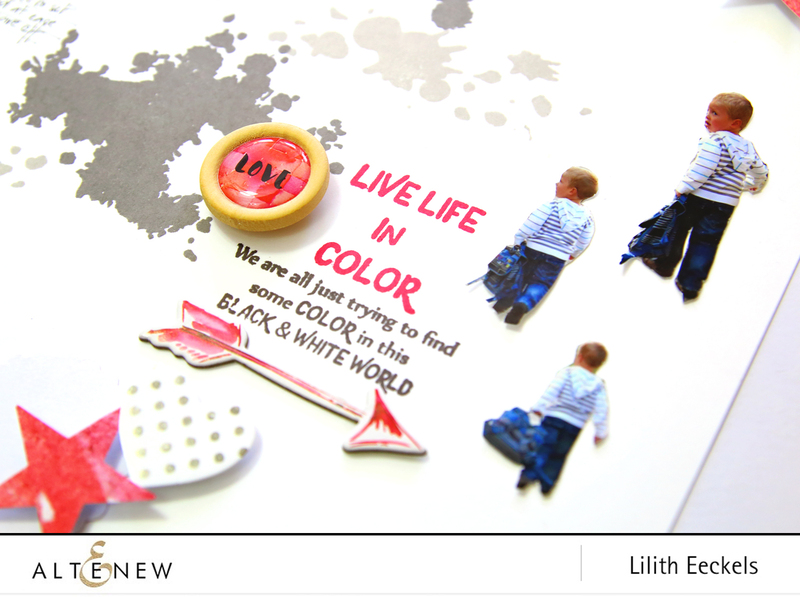 Fantastic layouts Lilith and the Smile More set is so beautiful AND versatile. Fantastic release, love your work. Your designs are very cool! Beautiful choice of colors. I especially love the bubbles. Inspired! Thank you! really lovely projects and colors! Fabulous layouts Lilith, love them all specially the first one. I love all the florals in this release but it is definitely hard to chose favorites within this amazing release, thanks for the inspiration and have a lovely weekend! I like how you used the bubble stamp! Great layouts and I love the new Ink Splash stamp set. Thanks for sharing. Such creative use of the new stamps! Love the blue & green together...beautiful contrast! Great layouts! I especially love the vibrant blue and green flowers. Beautiful layouts! Gorgeous designs and use of color! Love them all! Great layouts and the splashes of bright color is fabulous! I love the LO with the little boy and the pop's of color. great layouts. LUV the bubbles! 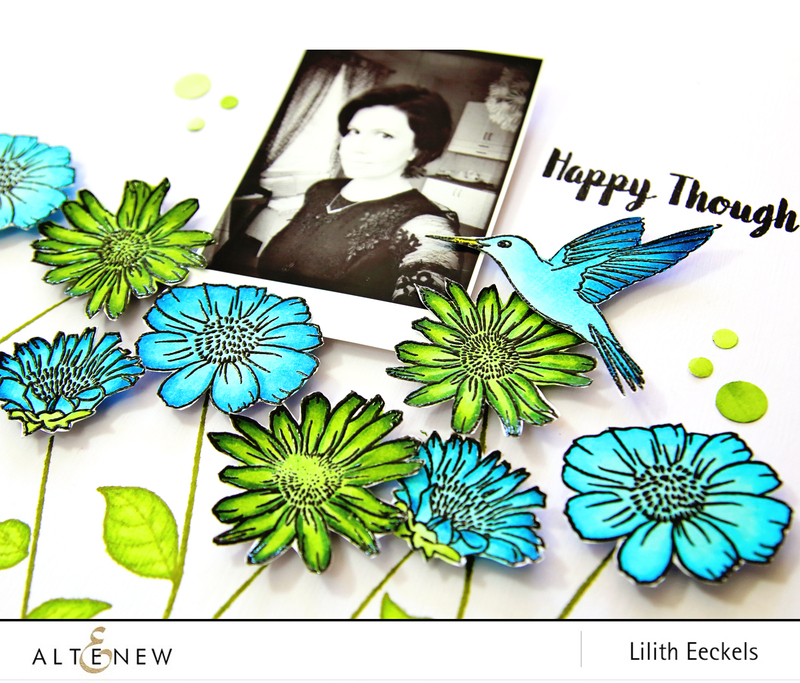 Love how you've shown us that these new Altenew images look just as beautiful on a scrapbook LO as they do on cards! Such original layouts! Love the new designs! I’ve already ordered a couple of them because I’m an instant gratification kinda girl! Love your layouts. Thanks for the inspiration. This release is fabulous. Very lovely work. I like your ink splashes in your layout, they go great with the sentiment. Thanks for sharing with us. Inspirational layouts, Lilith! I particularly love your first example - clean, modern and utterly fab! You have some great projects, thanks for sharing them. 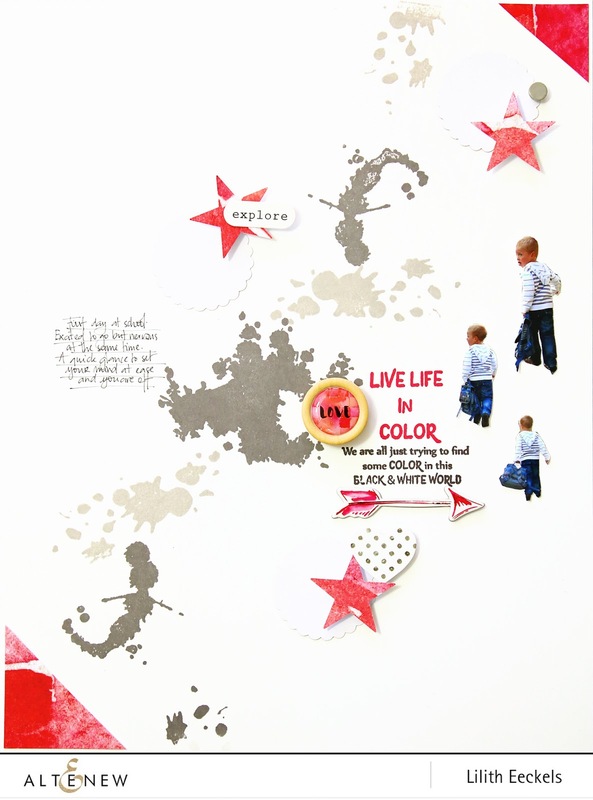 wonderful layouts - love your style! 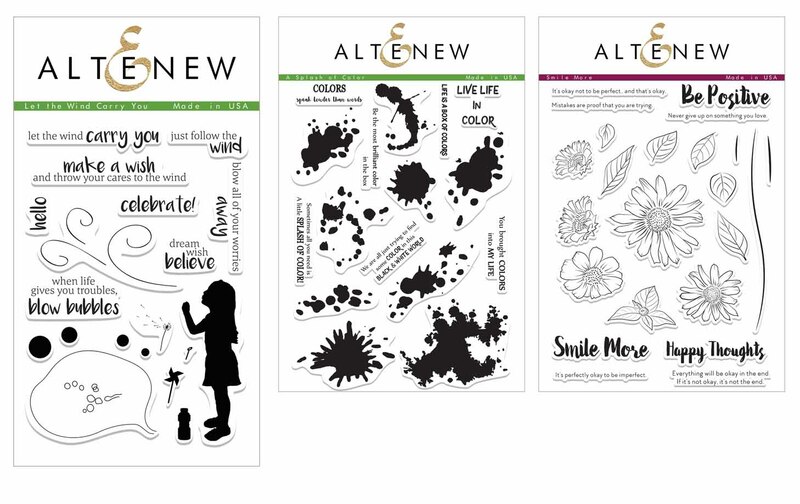 Your layouts are great and Altenew has so many versatile stamp sets in this new release. The flowers of the Smile More stamp set seem so fun for cards. I love the flowers in the Smile More Set and how you colored them. I think the cutout photos looked great too! TFS. 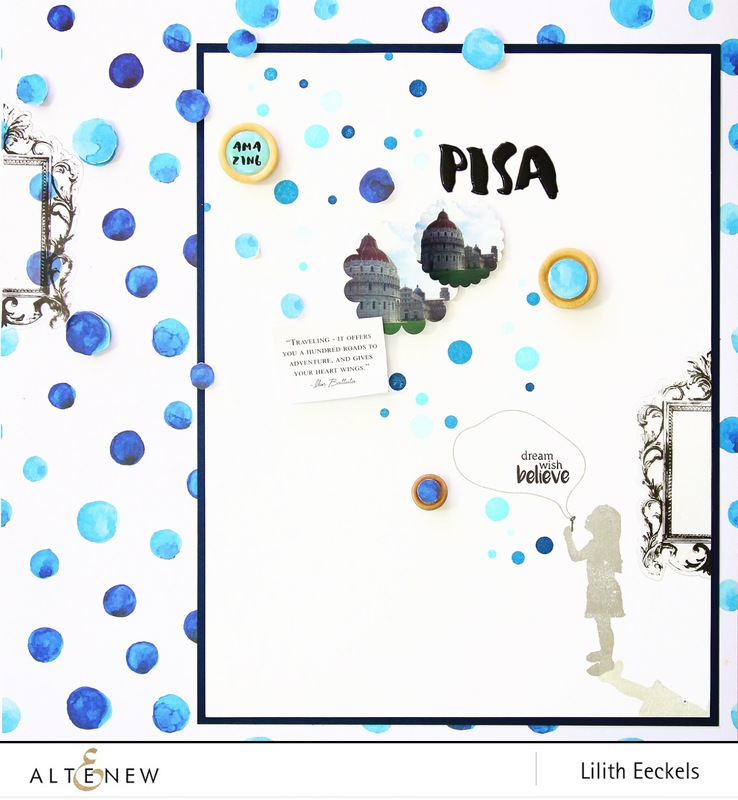 LOVE the Pisa layout and the colours on the last one are stunning. Gorgeous layouts, great use of the stamps to showcase. The Smile More set is one of my favourites & I love how you have used it on your layout. I also love your layout design with the splatters & Let the Wind Carry you set. I like your artsy layouts! Great projects! I especially like what you created with the ink splash set - very cool and fun! Love your beautiful, creative projects. Love your layouts. I really need to scrapbook more. So amazing! 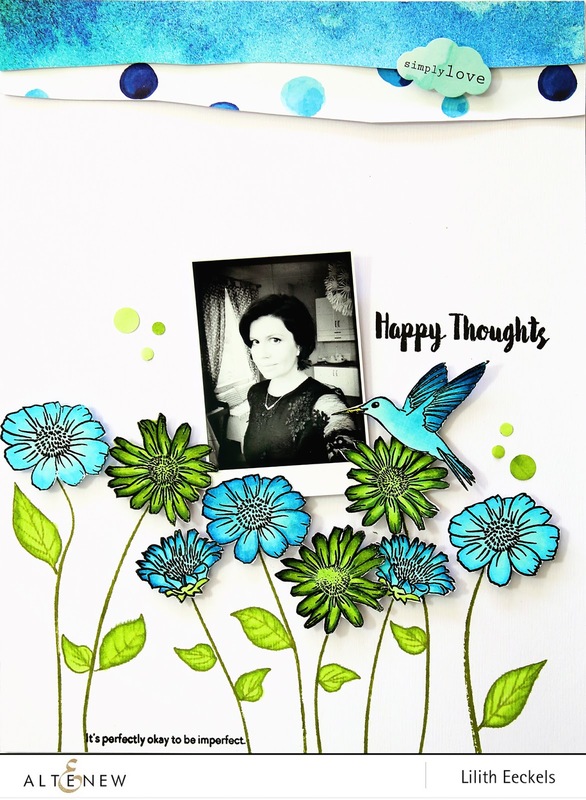 You are a very creative Scrapbooker - beautiful! super fun projects! great color combos too! Enjoyed your layouts and use of the splotches stamps! Thank you. I especially love the blue and green flowers. Beautiful! Lovely pages, thank you for sharing. Beautiful projects, love the colours. Oh my I love your layouts I hope you hang them up for a while to enjoy them they are just beautiful! Oh, what fun layouts. Lovin' the splatters and those flowers. Wow. Just lovely. Love the layouts, but especially love the colours of the flowers in your second one, so vibrant and fresh. I love your Happy Thoughts layout. The colors are beautiful. I love your layouts. You showcased the three stamp sets perfectly and in a stunning way. I don't do layouts but it's fascinating to see them. Great layouts and use of these sets. Your first layout has me absolutely awed! I love how you did the pictures and the colors ROCK!! I love the Let the wind carry you set!! TFS! Your layouts are so original! I especially like the last one with the blue/green color combo - very pretty! I must have those splotches! Lovely work. Thanks for sharing. Amazing layouts, you are so creative and I love your creations! Very creative layouts. Beautiful color on the flowers. Just lovely layouts! I love the color combinations you used and how you used the stamp sets on each one. Makes me miss my scrapbooking days. Thank you for sharing your beautiful work! Wonderful layouts using sets from this great release! Your use of color and simple design creates a perfect backdrop for your photos in these layouts. Your designs give me some great ideas for how to use these stamps in my own scrapbooking. Thanks for sharing your creativity. So creative and artistically out of the box! Love those blues and greens together too! This is such a great release by Altenew! I just love to start my weekend off with a great blog hop like this one! Thanks for sharing your talents and inspiration! Great work... I especially like the Smile More layouts!!! Love your layout Lillith! The flowers are so vibrant. I've been scrapbooking for 20 years now. I have to confess I do more cards these days but your layouts have inspired me to get back to it. Awesome LOs!! Love the bright colors!! Still digging those handmade dots you shared on FBLIVE Lilith:)) Love the blue/violet blooms and the Red graphic splotched layout! Love the clean design with pops of color on your pages! Beautiful layouts. Great use of the new stamps. Love the daisies! The colors are so fun! Wow! Amazing layouts. I love the blue and green floral. You are a master of white space. Beautiful coloring. Thanks for sharing! Wow love your layouts! Beautiful Work! Love your layouts. I NEED the new markers. Such pretty and creative layouts. Love them. What great layouts! Thanks for sharing! As a scrapbooker, I love seeing the stamps on layouts. I love the simplicity of the bubbles layout and the vibrant flowers on the last layout! Wonderful layouts with beautiful photos and details! Love the page with the flowers and hummingbird! Your layouts are really beautiful! I love how you use such vibrant colors against the white background in your layouts. It really makes them "pop." I especially love "Happy Thoughts" with the addition of your handmade patterned paper at the top. Thanks for sharing! Wow, what great layouts! The ink splatter set really looks like a lot of fun! Great designs and the collars are stunning! Wow your pages wonderfully incorporate these fabulous stamps. 2 tones circles are my favourite. Oh how pretty! 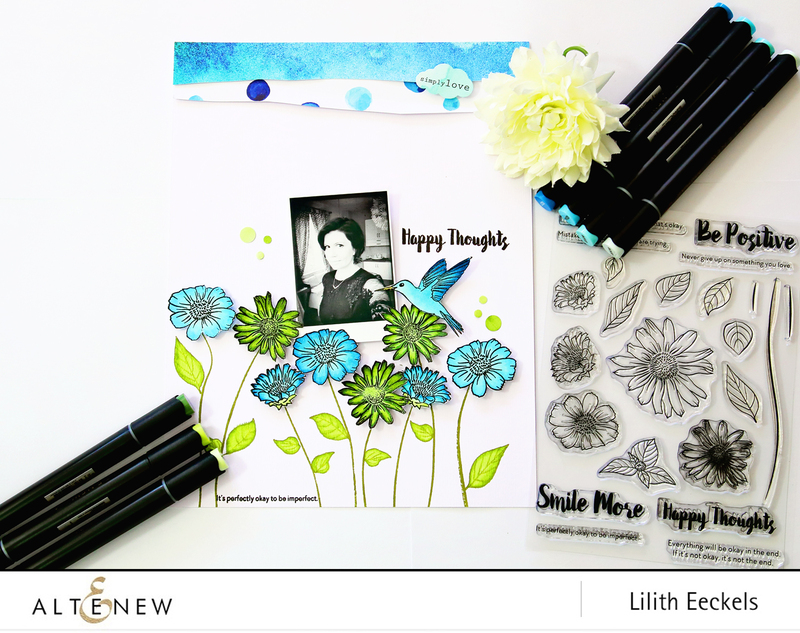 Love the various ways you've used stamps in the layouts! I enjoyed your layouts especially the cut outs of the little boy. Your layouts are just beautiful. Little works of art! Love the Smile More card. The long stem flowers so fun. I love how you use color and white space to pop your layouts! The photo cutouts turned out great too! I really like the simplicity of your layouts. Plus the coloring on the happy thoughts is beautiful! Great use of the stamps. The hummingbird is such a great focal point. You do know how to use color to the best advantage! I just love the blue and green layout. Whoever said that blue and green should never be seen, had not seen how these pop so well. Fantastic layouts. I really like the design of your splash of colour layout and the gorgeous bright blues and greens of the smile more flowers. Fabulous projects! And beautiful coloring on the daisies! Love it. What terrific layouts! I'm glad to see the splashes stamped out because I think that one looks like a fairy or mermaid. Cool! I especially love your bright colors against the B&W photo!! Thanks for showing us some scrapbook pages. Nice to see something different! 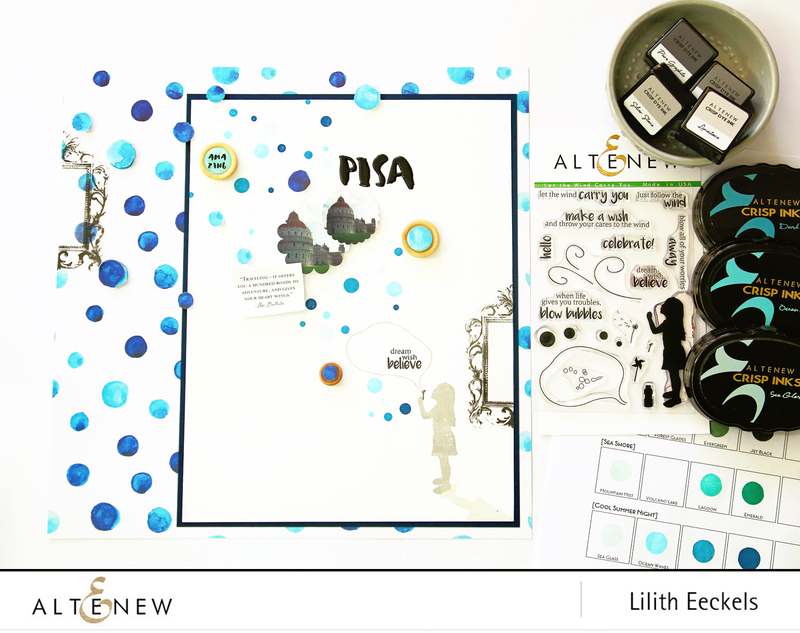 Loved your use of blues and greens for your layout. So fun and lively. 3 Amazing layouts. When I saw the first, I said Wow, and then there was another ... and another. Bravo! These layouts are all just so beautiful and crisp and clean, that last one is my favorite, love those flowers! Wow all of your layouts are amazing, they are really beautifully designed! Your pages are very creative, unique and beautiful. I love how you colored the flowers. Fabulous! Lovely creations, layouts and card. Great use of the stamps and the new markers. Love the colors! Your pages are spectacular!!!! Love your style. Wonderful designs with great dimension. WOW! Your layouts are wonderful!!! Love them all and this new release!! Your layouts are beautiful! I hadn't even noticed the Smile more kit until you used it here. Fabulous! Nice layouts! The paint splashes are pretty cool! Great Altenew release! Beautiful pages and work. Thanks for sharing! Oh so pretty! Love your choice of colour combination! Very cool! I like them all but my fav is the one of you with the hummingbird. It's so pretty. The first one of that adorable little boy is really cute. I love that he is running across the page. Im not sure it is supposed to be but the splatters in the bottom left look like Peter Pan, which I thought was so cute with the little boy layout! Beautiful layouts. I really like the school one. Great job. I love these colorful layouts! They are so cheerful. WOW - I am IN AWE of your CREATIVE use of these stamps and colour, LOVE your STYLE! I don't do scrapbooks but your layout looked lovely! Of the sets of stamps you used was the "Let the Wind Carry You". Your layouts are so inspiring! My favorite is the wild hibiscus stamp - so spring like! Beautiful layouts, love the white space. My favorite from this release is the Amazing You set, and the Halftone Circles. I just cannot pick only one fave set nor only one of these amazing scrapbook pages - love them all! Love your layouts!!! What you've done with the Let the Wind Carry you set is just fab- I love it! Wow your layouts are beautiful. I love your use of white space and the colors of those dots! The green and blue flower/hummingbird layout is great too! Wow! Your layouts are amazing! 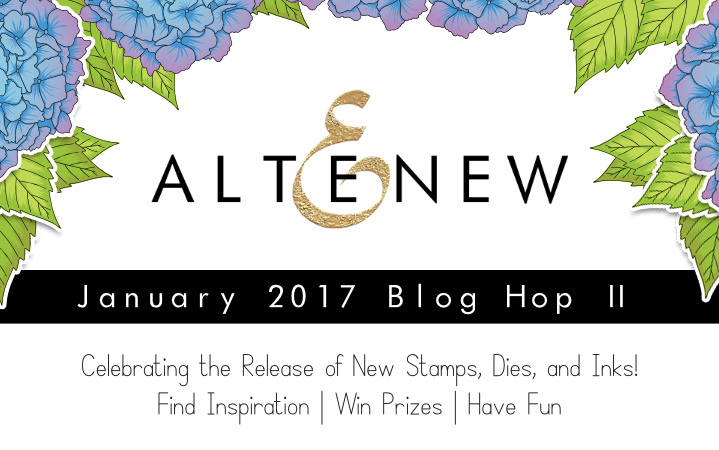 I'm so glad I came upon this blog hop and that you are participating!! Thank you! WOW! what can I say about this wonderful release. It is awesome and I love your blue and green combo. Amazing scrapbook pages ! You did a wonderful work to showcase these new release stamp sets ! My favourite is the Happy Thoughts page (and you look great !). Thanks for sharing. What a wonderful, creative designer you are. Thanks for sharing! Your layouts are so clean and pretty. Pretty colors too! Your layouts are gorgeous. Thanks for sharing. Your layouts are really beautiful. Love the colors. Beautiful layouts! Brilliant usage of color!